The $245 1975 dealers MSRP apx equals $1000.00 in 2007 prices. Beautiful phono stage. Trademark "Marantz Sound"--that is, the closest SS will ever get to tube sound--and without the hassel. It has no weaknesses. I have owned and still own several of these. The rated (by Marantz) 30 watts RMS is more like 45 and, in the real world, it will crush modern digital gear rated at 100 watts. These is a little GEMs of the vintage audio equipment, the sound of the Marantz 1060 is great. I have mine since 1988 and i love it. I now have the dream system of my youth in 1975! Back then I spent my money on speakers and bought a pair of used KEF 104s at $250 each. About half new price. I still have those speakers and only needed to replace the grills. Anyway, I have been one happy audiophile for a long time and the 1060 just makes my day. Weirdly, I now feed it mostly with an audiophile internet radio tuner on stations with 300 kbs such as Lynn. Call me one happy LAZY audiophile! Bought new in 1972, when I was 25, and still enjoying 45 years later. Only problem is a noisy, scratchy balance pot which sometimes fails to read R channel input. Had not been used in months. However as I resume using regularly, this is clearing up. Reliability certains exceeds what I read in reviews of modern integrated amplifiers! Hardly anything I can add to the reviews already posted.. the 1060 is great, and has the trademark Marantz warmth. At 30 WPC, it will not be a party animal to be heard down the block... If you're reading this, it's probably not you intend to use it for anyhow.. It WILL however fill a a living room with crisp, warm sound. Couple it with a speaker that has a good 6-8" woofer. I picked up my unit at the local landfill (SCORE!!! ), wood cabinet has some scratches, the switches were sticky and the faceplate was very dirty.. A little bit of cleaning, some compressed air on the insides and some contact cleaner and it's good to go. They were relatively common, and as such can be found without incredible 'collector' premiums, and I'd recommend one to anybody. My Father purchased this amplifier when he was a young man. I inherited it when I was born. I first used it in my young teens and didn't really know then that I had a gem. I first used it with a SEAS kit. This combo was a dream. In my youth I felt the need to replace it with my own amplifier. at the time multi channel was just about coming into the market. I went auditioning but nothing compared to the 1060. Later on I realised that it was a dream of an amplifier. The 30 wpc rating as most people here have said is indeed a bit too conservative. apart from that the amplifier is 1 ohm stable. In my youth I've done some silly things. One of them was connecting every single speaker I owned to the amplifier at the same time. it sounded incredible and is still alive and going strong. the amplifier has been placed on its side while operating and had all its grills covered. its never run hot or been damaged. at one point I used it to run 4 ohm subwoofers and it did just fine. On a more serious note. this amplifier has a modular design so one can use the preamplifier. or power amplifier separately. its Preamplifier is easily the best vintage preamplifier I've ever owned. Its phono stage is out of this world. and the line inputs can take a fair amount of level abuse before there's noticeable saturation and distortion. aesthetically this is a beautiful piece of kit. some might not like its form factor as it is slightly smaller than the standard 17 inch wide components of today. so if you had your heart set on placing a modern cd player on top of it you might be disappointed. I now own three and use them in different rooms in my house. they work well with most speakers but try them with some high efficiency drivers (like fostexs or lowthers or audio nirvanas) and you will be blown away. Its usually described as a soft warm sound so the absolute best match would be a pair of overly bright detailed speakers. but that's all just a matter of opinion. one can usually find these quite cheaply and usually working quite well. after 40 years there may be some mechanical switch issues but I have no problems on any of mine. its well worth the investment. probably the best vintage budget gear that's also pleasing to look at like most of the Marantz gear from that era. Well, well I said when offered a 1971 Marantz 1060 with a pair of original Bose 901's with working inline equalizer and a Philips 212 Electronic turntable all in SUPERB! condition. For a low end amp. at 30 watts per channel it sounds great. ( My last setup was Mark Levenson 380s series preamp w/ Levenson 39 cd transport DAC. through Sonus Faber Guinary Homage speakers and REL Storm sub Brits did good on this) smoken real sound and more depth image than a cave. For almost 30,000 it should. But this set up is in my living room and sounds great. Nothing close to the presence given buy the last setup. I'd give up fast food to get that one back. I got this Marantz 1060 at a thrift store for $1.95. It was dirty. It was like it had some sort of fertilizer on it. I was in the back with this guy looking for an IBM 'clicky' keyboard. I saw this under a load of trash. I asked the guy what he would want for it. Best deal I have ever made. Next I had to get some speakers. So I settled on a pair of Klipsch KG-1.2's from another thrift store for $60+tax. I had a choice of the Klipsch's or - KEF Coda 7's or - B&W's. I thought the Klipsch's would be a better match. What I like about this set up is how well it sounds at a low volume. The Klipsch's are so thrifty with the wattage. Here is the funny thing. I have these upstairs in my bedroom. I replaced a BOSE Wave Radio I was pretty sick of. The funny thing is my girlfriend was lying on the bed and she says, "it sounds like it is coming from the middle." "That is imaging," I said. Well she doesn't know what imaging is but she knows what it sounds like. Very funny. So, I thought about getting this unit cleaned. But right now it is working perfectly. Compared to my Mythos ST's with the Onkyo Integra M-504 amp, it is just great. So, I have always wanted to get a Leica at a thrift store for 50 buck. I doubt I ever will. Two dollars for the 1060 was just great. 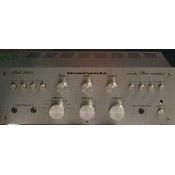 I HAVE HAD MY MARANTZ 1060 SINCE 1973. IHAD TO REPLACE THE POWER SWITCH WITH A TOGGLE SWITCH AFTER ABOUT 5 YAERS. RECENTLY CLEANED THE CONTROLS WITH ELECTRICAL CLEANER AND BLEW OUT THE DUST. CLEANED UP THE OPTIONAL WALNUT COVER. STILL LOOKS LIKE 1973. IT IS STILL IN USE AND SOUNDS FANTASTIC. I WILL NEVER SELL IT. I purchased my 1060 new when I was 23 years old and I am now 60. At the time, I also bought Altec Bolero speakers, which to this day, sound rich and almost 3D. I still have them both, but now, the 1060 drives a pair of Polk Audio speakers. Over the years I have had many amps and none of them can come close to the clarity and excellent reproduction of music. It is important to note that in the nearly 40 years I have had this beauty, it has only seen the repair shop once. It is difficult to describe the sound other than clear and precise. The highs are wonderful with no harshness, which allows the bass to "be there" without the overpowering mud that frequently happens. I love this thing and will repair/replace it should it ever die. The way it has stood up, I will probably go first!